Globocan 2018 report says between 2012 and 2018, India saw 11,57,294 new cancer cases. On World Cancer Day, experts say lack of access to treatment remains a challenge. New Delhi: In International Agency for Research on Cancer’s Globocan 2018 report, India reported a total number of new cancer cases at 11,57,294 — a 15.7 per cent increase in all cancer cases between 2012 and 2018. 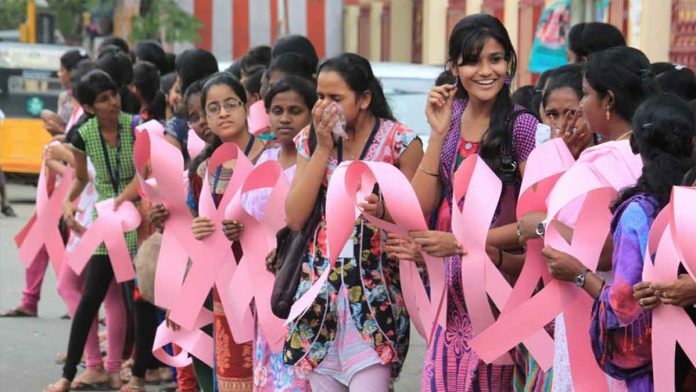 The Globocan data released in November last year showed that breast cancer remained the most prevalent form of cancer in India — with a 10 per cent increase — while cases of the second-most prevalent form, the lip and oral cavity, saw an alarming rise of 114.2 per cent in the six-year period. The number of cancer deaths in the country increased by 12.1 per cent to 7,84,821 in the same timeframe, said the report. While India is believed to have introduced the latest technologies towards cancer treatment, lack of access remains a challenge. Experts also express concerns about late detection of certain cancers. On World Cancer Day, ThePrint looks at the current prevalence of cancer in India and new treatments to contain it. The top five prevalent cancers in India are breast, lip and oral cavity, cervix uteri, lung and stomach, according to the 2018 report. Among males of all ages, lip and oral cavity, lung, stomach, colorectum and oesophagus were the top reported cancers, while in women of all ages, breast, cervix uteri, ovary, lip and oral cavity and colorectum were the most prevalent. In September last year, a Lancet study showed increase in breast, liver and lung cancers in the country. It compared the state-level disease burden in the country. The Lancet study pegged the number of lung cancer cases in India in 2016 at 67,000 — 72.2 per cent of them men. The incidence was accounted to use of tobacco and air pollution. Before the Globocan data was released, ThePrint had reported the growing trend of lung cancer among non-smokers and women. The only relief for the country, according to the Globocan report, was that cervical cancer saw a 21.2 per cent drop since 2012 nationally. India has the latest treatments available for cancer. However, the huge income disparity comes to play a role due to the expensive nature of multi-modal treatment. “What is available in the West is available in India too. Even if there are medicines which the country falls short of, we can procure them from abroad,” Dr. Sumit Goyal, senior consultant and unit head, Department of Medical Oncology, Rajiv Gandhi Cancer Institute and Research Centre, told ThePrint. “The only shortcoming in treatment of cancer in our country is that the latest medicine is beyond the reach of most of the patients,” said Goyal. The modalities of treatments in cancer include surgery, radiation therapy, chemotherapy, immunotherapy and targeted therapy. In India, all these latest methods are available. Radiation therapy uses electrons in targeting the tumors in the body to destroy them; immunotherapy uses certain parts of a person’s immune system to fight the disease; chemotherapy refers to drugs that prevent cancer cells from dividing and growing, while targeted therapy is done through molecular profiling. “There is no sequence in giving the treatment to the patients. Depending on patient to patient and the type of cancer and the stage at which the disease is detected, the oncologist could recommend a vast array of treatment,” Dr Pramod Kumar Julka, director of Max Institute of Cancer Care, told ThePrint. “Sometimes two patients with similar disease could require different approach in treatment,” the senior oncologist said. Julka said molecular profiling is new for the Indian healthcare system. “In earlier days, all cancer patients were given treatment on the similar lines but now we are at par with the world-class cancer treatment. However, the only problem is that the treatment is very expensive,” he added. The latest radiation therapy, which is the most expensive too, is Proton Beam. On 25 January, the first centre for this treatment in South East Asia — Apollo Proton Cancer Centre — was opened in Chennai. “It is the most precise form of radiation therapy that can be administered using proton beams unlike the usual electron radiations to kill tumors in very specific hidden sights. It is highly precise for tumors in spine, in some portion of the lung, base of skull, brain, eye-ball structures,” said Dr. Sameer Kaul, senior oncologist, Apollo Hospital. “While this therapy is precise with very little side effects, I would say the only side effect is personal bankruptcy,” he added. On an average, the estimated cost per patient is about Rs 20-30 lakh. Experts refer to lack of treatment as a major cause of worry regarding containment of cancer. “Our cancer registry system has reached 10 per cent of the country. We have 15 lakh cancer patients as per the ICMR but how many patients are treated? Not even 3 lakh. So, where are the 12 lakh patients going?” said Dr. Abhishek Shankar, associate professor, All India Institute of Medical Sciences (AIIMS). “It is unfortunate that one third people are hardly getting treatment in the country. Nobody is talking about it,” said Shankar. He said esophageal cancer figures were the third highest in the world in Meghalaya while Mizoram’s Aizawl belt has highest gastric cancers. “What happened after the Lancet published the Global Burden of Diseases (2018)? There was no government action… In states like Bihar, Jammu and Kashmir, there is no cancer registry,” he said. “In Uttar Pradesh, the largest state, the cancer registry was started in Gautam Budh Nagar a year and a half ago,” he added. Commenting on the Modi government’s Ayushman Bharat insurance scheme for the poor, Shankar said it will take time but it has the potential to show positive results. “If you really want to reach the last men and woman in the country, this can only be done by the government. There is a need to work together for the private and the government so that we can work collectively and do more for the society,” he said.